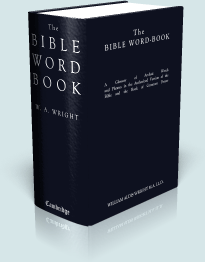 The Bible Word-Book is a a unique dictionary. It is not theological, but linguistic. It's purpose is to clearly define words in the King James Bible which are uncommon in use, or have changed meaning since the translation of the KJV. 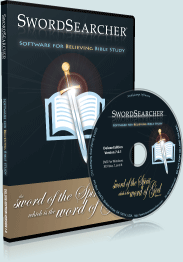 This "glossary" includes well over 2,000 definitions, most of which include copious examples from Pre- and Old-English literature, establishing an accurate etymology, helping the student of the English Bible to understand the intent of the translators. In considering the language of our English Bible [KJV], we must bear in mind that it has become what it is by a growth of eighty-six years, from the publication of Tyndale's New Testament in 1525 to that of the Authorised Version in 1611. Further, it must be remembered that our translators founded their work upon the previous versions, retaining whatever in them could be retained, and amending what was faulty. The result was therefore of necessity a kind of mosaic, and the English of the Authorised Version represents, not the language of 1611 in its integrity, but the language which prevailed from time to time during the previous century. It is in the writings of this period, therefore, that illustrations are to be sought, and from them the examples given in the present volume are chiefly derived. All these examples, except where the contrary is expressly stated, have been gathered in the course of independent reading, and in the few instances where quotations have been borrowed they have been carefully verified. Meticulous effort has been taken to maintain the intent of the author to present the reader with original spelling and grammar, including printing characters which have fallen out of use in the English language. Many words, spellings, and characters which may appear to be errors are in fact accurate quotations of Pre- and Old-English works. By William Aldis Wright, M.A., LL. D. Based on the original uncompleted work of J. Eastwood. Second Edition; Revised and Enlarged; 1884.